If you fervently wished for a horse as a child, you probably thought more about the horse’s color than the breed. As your horse riding turned serious or competitive, however, you may have discovered that specific breeds and types are more suited -- and coveted -- for certain disciplines. Warmbloods and thoroughbreds have distinctive characteristics that may make them ideally suited for specific sports, although exceptions exist among most breeds. Warmbloods are a category of horse that contains several breeds, or bloodlines, within it. The reason is that warmbloods originated in Europe, and each European country bred horses for uses specific to that country. In the earliest years, this was work, whether it was pulling carriages on a city street or pulling logs for farmers clearing land. As such, they were historically strong, stout horses. As work needs changed, breeding focused on sport and competition. The warmblood breeds are named according to the individual country; for example, Hanoverians originated in Hanover, Germany, while Swedish Warmbloods originated in Sweden. The modern warmblood sport horse boasts five generations of recognized sport horse bloodlines. Due to their origins as work horses, warmbloods have draft horse characteristics that were increasingly thinned for a more refined and versatile equine athlete. Like warmbloods, draft horses encompass several breeds -- one of the more popular are the famous beer-wagon Clydesdales. Breeders discovered that by adding the characteristics of an athletic hot-blooded horse, such as an Arabian or thoroughbred, they could temper the massive size of the draft and add some speed and stamina, while keeping the strength. Warmblood legs are typically wider and stronger than those of refined breeds, so they can easily carry their own weight and a rider’s -- and pull something as necessary. Although a generalization, modern warmbloods have a good temperament, but are not known for racing speed. They are well-suited for dressage and many jumping sports. Thoroughbreds are a breed within the hot-blooded horse category. The thoroughbred’s history has always been one of an athlete. The breed began in England, with its foundation -- or first -- ancestors of the breed being brought from the Mediterranean Middle East. 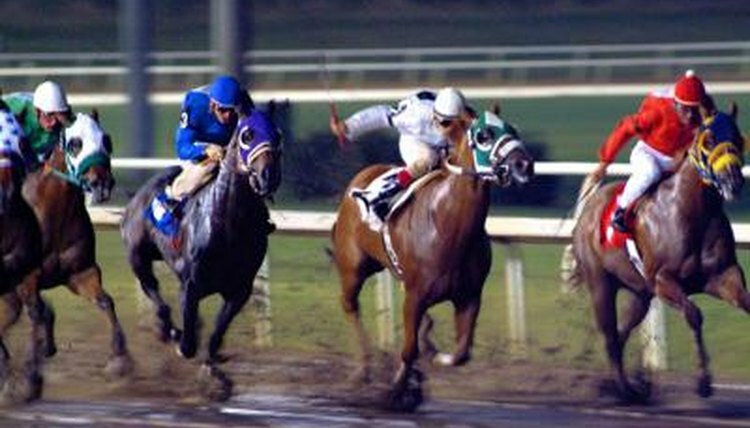 In the United States, thoroughbreds are the traditional racehorses, with famous names like Seabiscuit, Secretariat and Barbaro belonging to this breed. When you look at a thoroughbred, you may marvel at how the long, slender legs with the well-defined tendons can carry its body. They are the legs of a racehorse, designed for speed and a smooth ride. Fortunately the entire bone structure of the thoroughbred is typically lighter and more refined than most of its warmblood counterparts. They have higher and well-defined withers, which is the bony structure at the base of the neck directly in front of the saddle. The thoroughbred neck is typically long and elegant, making it well-suited for the hunter discipline. Their hind end is also typically higher, helping the horse cover long distances. While there are exceptions, thoroughbreds are known for speed, stamina and in many instances, a more alert and “high” temperament.